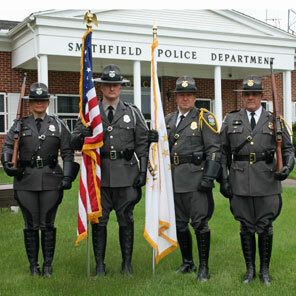 In 2010, the Smithfield Police Department celebrated 60 years as a permanent law enforcement agency. There’s a nice online collection of historic SPD photos provided by the Smith-Appleby House Museum here. 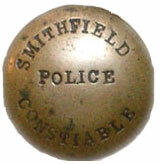 In 1937 the Town of Smithfield passed a Town Ordinance to appoint a police chief and deputy police chief as constables. 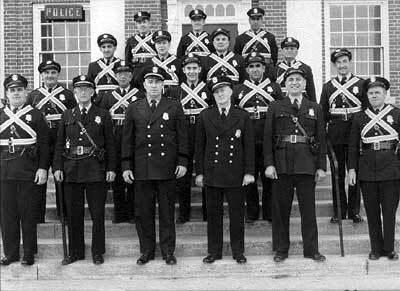 In 1950, the Rhode Island General Assembly passed an Act establishing a permanent police department, creating the positions of Police Chief, Deputy Police Chief, and Sergeant in the Town of Smithfield. 1955 photo taken outside of Town Hall which was the location of the Police Department until late 1972. Click the picture for a larger version with names. In those days, there was little to attract anyone to a career in law enforcement. 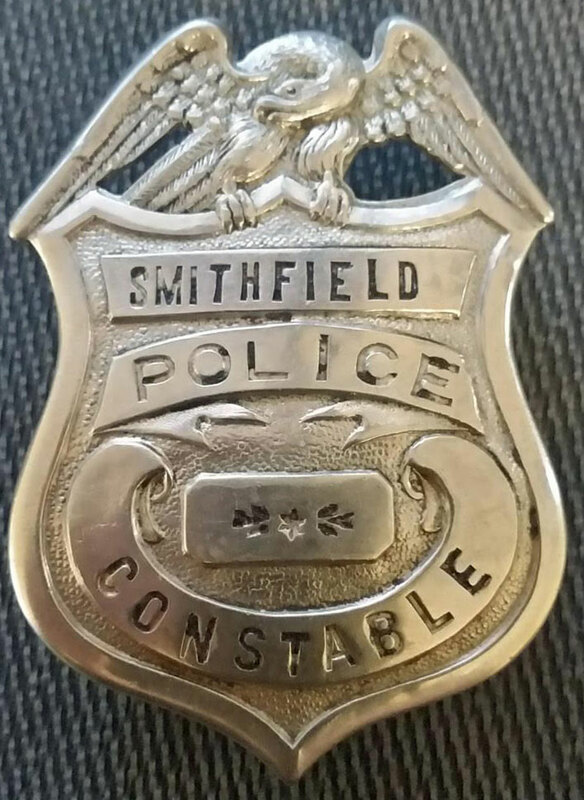 Smithfield police officers worked many hours per week, and pay was extremely low. There were no pension plans, paid holidays, uniform allowances, etc. There was plenty of extra work, but it was performed without compensation. Many times, an officer would work all night, spend the day in court, and report back to work that night for his regular shift collecting only his regular pay. There were no established policies and procedures, and little or no training. A police academy was created and basic in-service training seminars and courses began; however, it was considered an honor and a privilege for an officer to be permitted to attend such schools. When officers did attend, they had to provide their own transportation. All seminars and classes were attended after normal regular working hours. 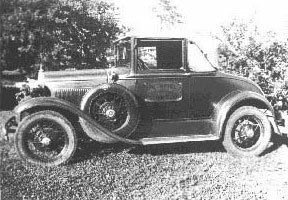 Photo of an old Smithfield Police car – the sign on the door says “Smithfield Police Department”. The date that the photo was taken is unknown. The Department operated out of three small rooms in the Town Hall: the Police Chief’s Office, a room for regular police business, and an interview room. Communications consisted of one telephone line, with an extension in the Chief’s home. When the sole officer on duty left the station on a call or patrol, the officer locked the station doors and put a note on the outside window advising anyone needing the police to call by telephone. In this manner, if the phone rang several times with no answer, someone in the Chief’s home would pick up the extension. If the officer on the road was needed for any reason, a message would be relayed to the State Police barracks in North Scituate, Rhode Island. 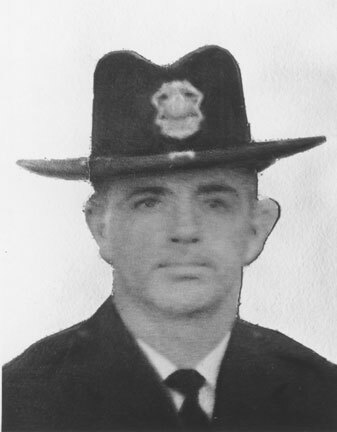 On a freezing cold day in December of 1968, Smithfield Patrolman Norman G. Vezina gave his life in the line of duty while attempting to rescue five year-old Kenneth Firby who had fallen through the ice and into the frigid water of the Spragueville Reservoir. Kenneth Firby also died that day. Click here to read more. Over the years, police activity began to steadily climb. As Department personnel increased in the 1960’s, it became necessary to establish full-time police services. It became very difficult to operate out of the three, small cramped rooms at the Town Hall. They slowly filled up with files, desks, alarms, typewriters, and a newly installed teletype machine, leaving little, if any, space for the police operations. In December of 1970, facing an obvious need, the Smithfield Town Council announced that a new police station was a priority item and approval would be sought at the annual Financial Town Meeting in May of 1971. Taxpayers approved the construction of a new facility and formed a building committee, whose first task was to select a site. The Town of Smithfield was extremely fortunate when a prominent family in town donated a large tract of land on Pleasant View Avenue. The land was undeveloped; however, members of the police department took it upon themselves to prepare the site. Many persons dropped off refreshments to the workers as they prepared the site, and countless spectators added their moral support. More often than not, families of the workers would be there, and it was not uncommon to see young sons and daughters of the officers happily riding in trucks as they bounced from one end of the site to the other. After several weeks of hard work, this phase was completed, and the site was ready for construction. In 1972, it was announced that the Economic Development Administration (EDA) awarded the Town a grant to help finance construction of the new station. The project went out to bid, the contract was awarded, and groundbreaking ceremonies were held in May of 1972. The building was completed in record-breaking time. On November 18th, 1972, the police moved into the new facility and began operations. Read the flyer from the Smithfield Police Station Dedication Day. Read the flyer from the 1977 Smithfield Policeman’s Ball. 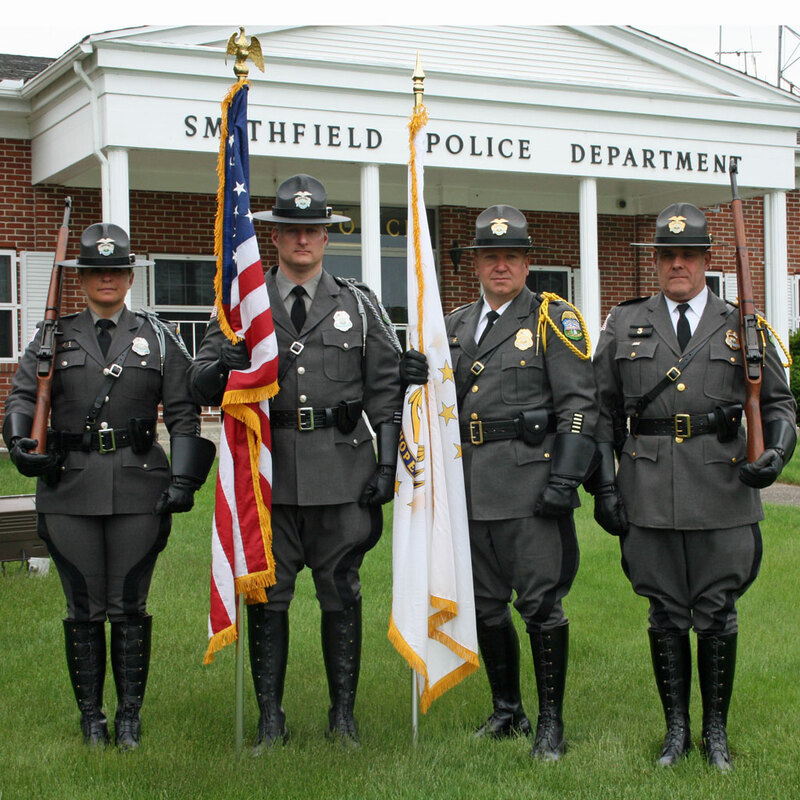 The permanent Smithfield Police Department steadily progressed since its inception in 1950. It has one of the most attractive, functional police stations in the state. From its meager beginning, with three full-time officers to its present complement of 40 full-time police officers and 13 full-time civilian employees, the Department now operates with administrative, uniformed and detective divisions in its organizational format. The police department is one of the most respected law enforcement agencies in the state. 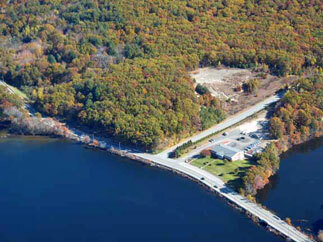 It’s headquartered in a two-level building on four acres overlooking the Stillwater Reservoir and houses a three-cell, lock-up facility. During the last decade, the Department has fully computerized all department operations. 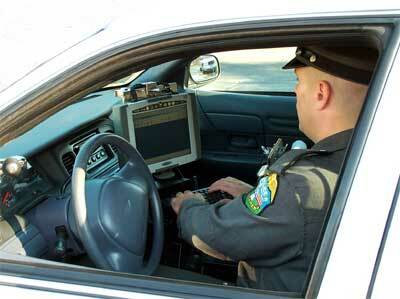 An IMC computerized dispatching, reporting and e-mail software package was implemented, along with new computerized links to the Rhode Island State Police (RILETS) and the FBI (NCIC). In addition, we have equipped all of our patrol vehicles for supervisors and patrol officers with state-of-the-art mobile data terminals that allow immediate access to federal, state and local files. The front dispatch area has also been completely renovated. The Department has also successfully obtained five U.S. Department of Justice/COPS Office grants. Pursuant to the awarding of these grants, the Department hired two full-time community-policing officers, a full-time juvenile officer, a full-time school resource officer, and installed mobile data terminals in all its patrol vehicles. The Department has also received four Homeland Security Grants for surveillance equipment, a multi-jurisdictional mobile command center, improvements in its public safety radio communication system and Incident Command Systems in-service training. The Department has also implemented a mandatory 40-hour, Department-wide, basic in-service training program for all sworn employees. In addition, it also provides outside in-service training, along with advanced and specialized training for all employees. The Department has also embarked on an aggressive Capital Improvement Program to improve equipment and the physical plant facility. Some of the improvements include new roofing, insulation, new windows and frames, renovation of the men’s and women’s locker rooms, reconfiguration/paving/sealing the driveway and rear parking lot, replacement of all heating/air conditioning units, enlargement and renovation of the Detective Division, conference room, patrol room and front communication center, completion of a new police maintenance garage in the rear parking lot and renovation of the entire cellblock/holding facility area. Recent capital improvements include a new generator/electrical system and renovation of the interior offices. In furthering the Department’s Written Directive System, the Department continued to revise its Policy and Procedure Manual, which was issued on March 1st, 2003. During the last year, the Department revised and updated eleven General Orders. The Department has also placed a second D.A.R.E. Officer into the school system, a School Resource Officer at the Smithfield High School, reinstituted the Boy Scouts of America Law Enforcement Explorers Post Program, revitalized the Neighborhood Crime Watch Program, established Project Safe Return and created a community policing satellite office in the Apple Valley Mall in an attempt to improve relations between police officers and residents/business owners in Smithfield. The emphasis of the Department has clearly shifted from a traditional law enforcement role to a more proactive, community policing style to better serve the citizenry of the Town of Smithfield.